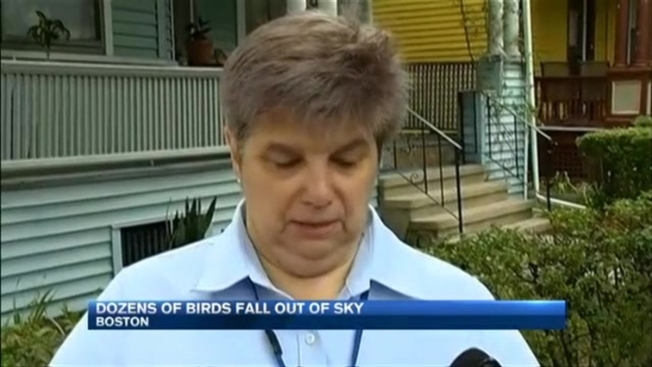 Health officials are investigating after 47 birds fell from the sky in Boston's Dorchester neighborhood on Thursday. Rescuers were able to save 35 of the birds, but 12 have died. Investigators are working to determine the cause, and whether the deaths of two cats in the neighborhood could be related. A third cat was also affected. "When I arrived, birds would fly, like from a house to a tree, they would flop in the tree and they would fall to the ground," said Alan Borgal of the Animal Rescue League of Boston. "The weaker ones were just falling right out the sky." All the birds were grackles, black songbirds that typically travel in large flocks. They were found thrashing around on Bakersfield Street and the sidewalks nearby around 2 p.m.
"They couldn't get up," said resident Linda Veale. "We don't know what is going on," said John Meaney of the city of Boston's Inspectional Services. "So we are investigating all avenues." City officials are looking at everything from a virus, to environmental poisoning, to something intentional. They're also studying the many feeders neighborhood residents have outside. "They could have put something out that was unintentional," said Meaney. "Something that didn't get along with this species of bird because we have two species here, and the other species did not die or get harmed." Willien Pugh's outdoor cat named Sally suddenly died Thursday morning, as well. "It's unbelievable," said Pugh. "Something is happening, but I don't know, but I'm without a cat." Investigators are trying to figure out if Sally's death is connected, and they are wondering if more pets could be tied in. "Now we have three domestic pets involved and 47 birds, so it's a concern until we figure out you what happened," Borgal said. The two dead cats and all of the birds will be tested. Investigators do not believe there is any danger to humans, but they say pet owners should be extra cautious as to what their pets are putting in their mouths when they're outside. The birds that died are being sent to Tufts University to be tested to see what may have caused them to fall ill. Test results are expected to be made available early next week. City inspectors were backed at the scene on Friday morning looking for any more dead birds, but they didn't find yet. There is still no cause, but poisoning is being eyed as a serious possibility.